Remove two hose clamps (Figure 1, Item 3) from hose (Figure 1, Item 4). Remove pipe (Figure 1, Item 5) and hose (Figure 1, Item 4) as an assembly. 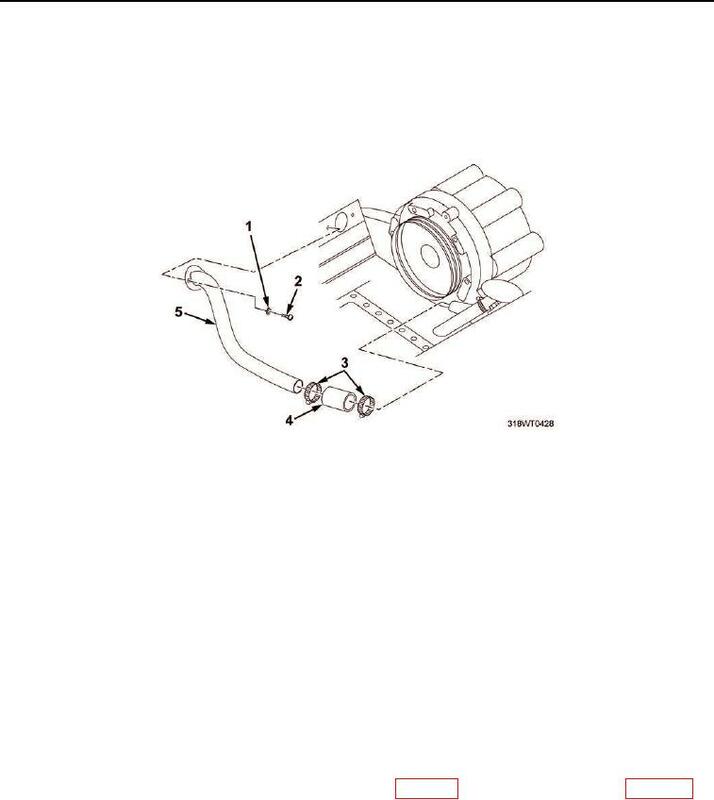 Remove blower drive (Figure 2, Item 4) and gasket (Figure 2, Item 3) from blower drive assembly. Install three bolts (Figure 2, Item 5) and washers (Figure 2, Item 1) in blower drive (Figure 2, Item 4). Using torque wrench, torque bolts (Figure 2, Item 5) to 300 to 360 in-lb (34 to 41 N·m). If backlash is out of tolerance, replace blower drive gear (WP 0113) or camshaft timing gears (WP 0065). Install hose (Figure 1, Item 4) on pipe (Figure 1, Item 5). Install two hose clamps (Figure 1, Item 3) on hose (Figure 1, Item 4). Install pipe (Figure 1, Item 5) and hose (Figure 1, Item 4) as an assembly. Install two socket head screws (Figure 1, Item 2) and washers (Figure 1, Item 1) on pipe (Figure 1, Item 5).